We have all seen scenes of animal carnage alongside local roads, state highways and interstate freeways. 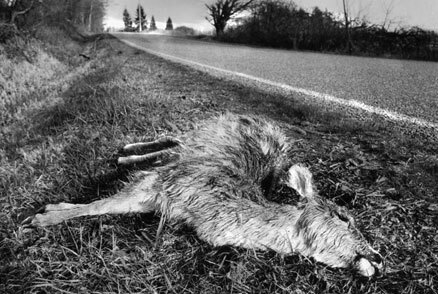 Deer, raccoons, coyotes, possum not to mention dogs, cats and a myriad of birds and water fowl have all fallen prey to passing automobiles in a variety of speed zones. Each day during summertime our windshields are coated with the smashed bodies of a Smithsonian size collection of winged insects. So much so we are disgruntled with cheap priced gas stations that refuse to put out windshield cleaner, scrappers or paper towels to aid in the debugging process. The aforementioned calamities are just the tip of the melting iceberg that brings us face to face with intense climatic changes, denuded forests and elimination of farm lands now displayed everywhere with for sale signs. Do we assume everyone will eventually wear space suits with air tanks, drink refiltered chemicals, eat scientifically processed sustenance and visit with family and friends on video phones? There appears no desire to stop and think how we can help our planet survive this murderous onslaught and total disregard by human parasites with globally unsatiable appetites.